Keeping your business safe is on the mind of most entrepreneurs, but securing your home is just as important. Over 3.5 million home burglaries occur in the U.S. each year, on average, according to the Bureau of Justice Statistics. Historically, over 80 percent of home break-ins occur on the first floor of the home. The most likely points of entry are the front door (34 percent), a first-floor window (23-percent), and the back door (22-percent). Those statistics make it pretty clear where you should locate security cameras around (and in) the home. With those key locations covered, look to a few other areas to ensure the best possible surveillance of your home. Home security cameras can catch intruders in the act and help police track down the perpetrators by providing visual evidence of the crime and, ideally, the criminals’ faces. But cameras do more than help with an investigation. Like home alarm systems, security cameras help prevent break-ins by deterring would-be burglars from entering a home. It is commonly said that burglars, like most things in nature, choose the path of least resistance. If burglars approach your house (or view it from the street) and see that you have security cameras and/or an alarm system, they are less likely to attempt breaking into your house. According to a study by the University of North Carolina, 60 percent of burglars are deterred by the presence of home security systems. Therefore, set up your system where potential intruders will see the cameras while also keeping them safe from damage. The general recommendation is to position cameras 9 feet from the ground or floor. This places the camera out of reach from someone standing on the ground, yet it’s close enough to capture a good image of the viewing area, and the camera is likely to be seen by anyone approaching the house or entry point. You can further protect a security camera by shielding it with wire mesh or similar material. This may help prevent (or delay) damage from an intruder throwing a rock at the camera or hitting it with a stick or tool. Be sure to test the visual effect of the protective mesh before installing it over a camera. Given the statistics on where intruders most likely enter a home, the front door is the prime location for setting up a security camera. A front door camera should face visitors as they approach the door and can view them standing in front of the door. In this key location, a camera should be visible to visitors but also out of reach (at 9 feet high, if possible). Keyhole cameras are effective for viewing visitors at the door before you open the door, but because they are right at eye level, they are easy for an intruder to obstruct. So a keyhole camera alone does not provide sufficient security for the front entry. Backdoors are common break-in locations because they are less visible than front doors yet offer convenient and quick access to the home. As with the front door, set up a security camera here so that it is visible to anyone at the door and has a full view of the approach to the door as well as the area immediately in front of (outside) the door. The challenge with setting up security cameras around windows is the number of windows on most houses. You can use a camera with a wide viewing angle to cover a bank of windows, as long as all vulnerable points are exposed to the camera. Windows are most vulnerable when they are in shadow or are hidden by shrubs or trees. Make sure a camera can view these areas and is visible to anyone approaching the window. Also cover low basement windows, which are vulnerable to break-ins because they are close to the ground (less visible) and are easier to break or break into than standard home windows. Security cameras and security lighting are important for backyards, especially fenced-in yards because once intruders gain access to the back of the house they are much less visible to neighbors. Set up wide-angle security cameras to cover the main area of the backyard as well as entry points, like fence gates or likely places intruders would scale the fence. Cameras with motion-detection should sense movement in the areas immediately surrounding the house. As with security lighting with motion-detection, the camera may not pick up movement far out in the yard but will turn on as someone approaches the house. The most important locations to set up security cameras are outdoors, to catch intruders in the act of breaking in or to deter them from attempting a break-in. But interior cameras also can be effective for both deterrence and detection. Typically, it’s best to have indoor cameras monitoring indoor space, such as the foyer of a front or back door, or a mudroom just inside a side door or garage door. If there are interior rooms with valuables or prized collections or furnishings, having cameras can provide some peace of mind and can be good places to get images of intruders if these areas are likely targets. If your home has a basement, consider installing a camera focused on the stairway leading from the basement to the first floor, to capture images of an intruder coming up the stairs. A camera in this location should have motion-detection and night vision capability because the staircase is most likely to be dark. Some security sources suggest installing cameras inside looking out through a window or glass panes in a door. This can work with some cameras and locations, but often the extreme differences in lighting between the indoors and outdoors result in poor images. Always test a camera's performance in a location before committing to it. 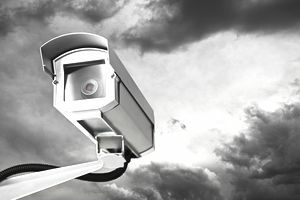 If you're investing in a useful system of security cameras, it doesn't make a lot of sense to supplement it with a few dummy cameras here and there. The only value they offer is potentially deterring some would-be intruders, and if they fail at this, you'll have no record of the break-in. Also, dummy cameras won't look exactly like the real cameras and might be spotted as phonies, which could serve as an invitation to break into those entry points "guarded" by the dummies.